1896 1:1056 OS Town Plan shows the layout of Ludgate Hill station as built with two narrow platforms. As can be seen the west platform is slightly longer than the east. The east platform serves the up and down main line, which coming from Holborn Terminus, passes through Ludgate Station and then on through St. Paul’s Station to the south. The western island platform has to accommodate all the rest of the traffic. Two stairways are seen on each platform, one on the south comes up from the booking office while those at the north end go down to an exit on Pilgrim Street. The overall roof covering all but the south end of the station is shown by shading. On the west side the station forecourt runs between Union Street and Pilgrim Street, a cabmen's shelter is seen in the south west corner of the forecourt. The hatching indicates a canopy in front of the station entrance to provide weather protection to passengers arriving by cab. A signal box on a gantry (SB) is shown running across the formation to the south of the station. The north signal box was at the north end of the west platform, this is not shown but steps in the north west corner of the station might have led up to it. A series of crossovers are seen at the north end of the station giving all incoming and outgoing lines access to Snow Hill tunnel or Holborn Viaduct station. The site of the Roman London Wall is indicated running parallel with the north end of the west platform. 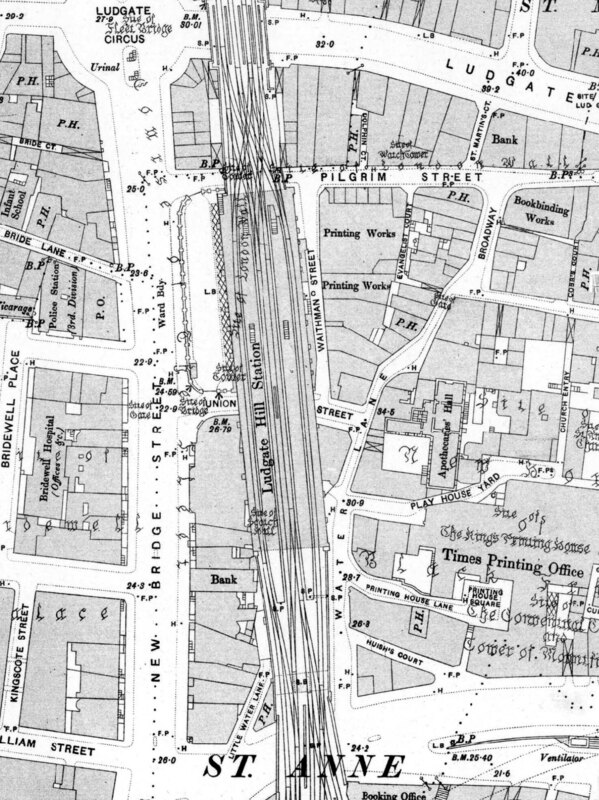 The booking office for St Paul's station is seen at the bottom of the map.